The 458 Italia continues the Ferrari tradition of putting the thrill into driving thanks to years of track-derived technological innovations. Finished in a “bi-colore” scheme of Rosso Fuoco (dark red) with a Nero Daytona (black) roof, the 458 Italia captures the racing heritage with carbon-fibre F1-inspired front winglets and carbon-fibre intake manifold and engine bay. Scuderia Ferrari Marlboro driver, Marc Gené was also on hand today to put the 2010 Ferrari F10 single-seater, which was driven by Fernando Alonso during his fight for the F1 title last year, through its paces up the famous hillclimb course. 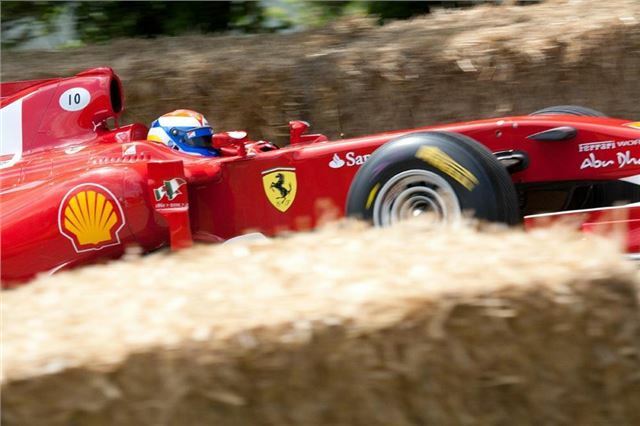 Videos of Marc Gene and the Ferrari F60 as well as several classic Ferraris at this year’s Festival of Speed will be available to view on Saturday 2nd July on www.ferrari.com.